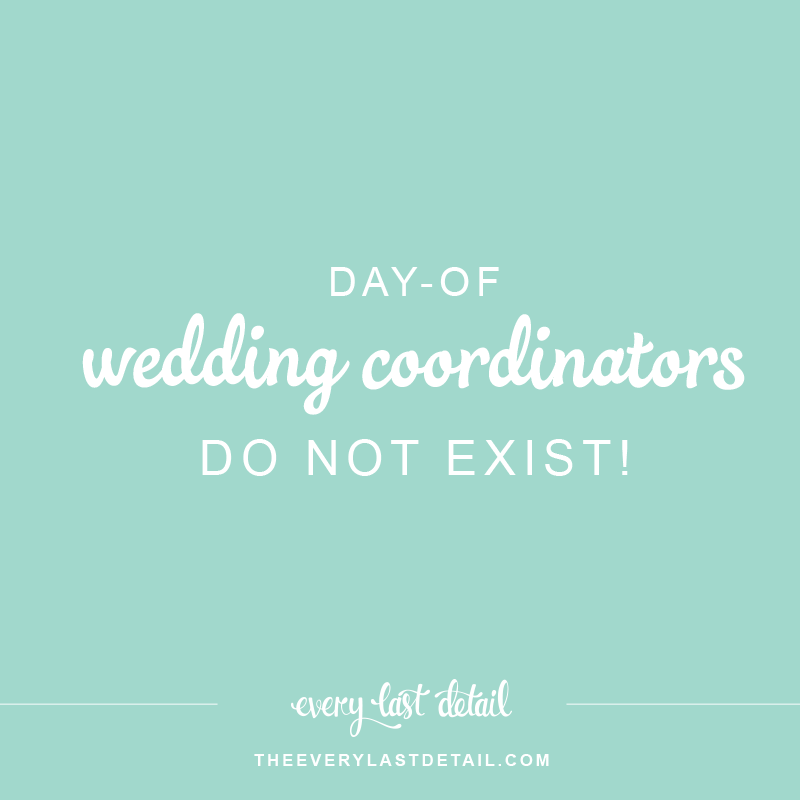 Why Day-Of Wedding Coordinators Don't Exist! I know, I know… they do exist. And a day-of coordinator is what everyone (myself included) says that you at least need to have for your wedding day to run smoothly. But the reality is that in order for a wedding day to run smoothly, a coordinator doesn’t just work for the day of the wedding. So in essence, we really shouldn’t be referring to these coordinators as “Day-of”! Think about it- would you want someone walking into your wedding on the day-of when they have no idea about anything that is supposed to happen? Definitely not, right? Having a coordinator for the day of your wedding is of course something that I highly recommend, but you must realize that for a coordinator to successfully carry out your wedding day, they need to be able to work BEFORE your wedding day too. Well thankfully, there are alternatives to “Day-Of” Coordination – “Month-of” Coordination and “Event Management”! Month-of coordination certainly isn’t a new concept, because it’s pretty much how the former “day-of” coordination service has been done for some time. Essentially, all of this is just a matter of recognizing that the term “day-of coordinator” isn’t correct. Wedding planners all over have decided that starting their coordination services 4-6 weeks before a wedding is enough time to get everything figured out and organized. This means that you hand over just about everything to your coordinator, and then they take over for you. You’ve done the planning up until this moment, and now your month-of coordinator is going to handle the rest. Vendor confirmations, creating your timeline, making sure everyone knows where to be, making sure you’re not forgetting anything- all of these are definitely things that you want done in the weeks before your wedding day, not on the day-of or the day before! And what makes it even better is that you get to enjoy (hopefully) the weeks leading up to your wedding! And then we have “event management“, which is a little bit of a newer term in the wedding world. Event management is meant to be more literal in definition, viewing the service as literally having your event managed, both on day of and in the months leading up to it. Often times with this service, it is starting more than a month prior to your wedding- usually around 2 months before. In my opinion, having an event manager is way better than just month-of coordination, because it means that the planner is going to be more knowledgable and aligned with your wedding and your expectations. “Imagine waking up on the morning of your wedding and not stressing about one single detail. You breathe a huge sigh of relief that you made the decision to hire a professional wedding planner to manage all the details of the wedding day. All you have to do is relax and enjoy each moment as your wedding day unfolds. So tell me- are any of you planning on hiring a “month-of” coordinator or event manager? How are you going to make sure your wedding day runs smoothly? A version of this post was originally published in June 2013, and it has since been updated. 15 responses to Day-Of Wedding Coordinators Do NOT Exist! I actually had 2 Day of Coordinators and they were excellent. Maybe I should call them “Days” of Coordinators since they only had the day before to catch up on their duties and the day of to perform. Great insight! I’m a bride-to-be getting married in April 2014. A “month-of” coordinator wasn’t originally worked into our bridal budget, but the more I learn, the more I feel we’ll need one. Now it’s just a matter of finding the right person! Keep the terrific tips coming — I’m a huge fan of yours! Great advice – it’s so true! You need someone to be there for more than just the big day! Great info and very true! Very thoughtful post! I think having a planner walk in cold on the day of a wedding would also just add to a bride’s stress rather than ease it. I appreciate your addressing this, however, I hesitate to say “NO” to day-of coordinators! Any professional who offers day-of coordination should get involved at least a week or so beforehand, even if it’s just for a final consultation with the bride and groom-to-be. For couples that are really struggling with staying in their budget, I’d say day-of coordination is still a great option – much better than no coordination at all. Pingback: MDE » Day Of Coordinators do NOT Exist! Reading a venue contract right now and cringing as I read through a section where they require the couple to hire a “day of” wedding coordinator. Literally,”day of” is repeated…and in quotations. Greatly wishing they could revise their agreement! Such a great article. Thank you for sharing this. Educating brides on everything that is required and all that goes into “wedding management” (the correct new term for Day of coordination) is key. At Dolce Vita Events, we do offer Day and Month of coordination but call it Wedding Management. Feel free to visit the site at http://www.eventsbydolcevita.com details on the service.